The Google vs. Facebook War: How Many Toasters Do You Need? After a two-month absence due to other demands on my time (clients and cycling in the French Alps! ), this piece sizes up the strategic challenges facing Google+ as it attacks Facebook’s established dominance in social networking. When two people move in with each other, there’s always an excess of toasters to manage. The introduction of Google+ raises a similar question for social networkers: How many social networks do you need? Let’s cut to the chase. Facebook scares the bejesus out of Google. Facebook is the social networking gorilla with 750 million users whose conversations are cut off from Google’s search crawlers. Plus, as the percentage of online time spent by users on social networks increases, Facebook attracts more advertising threatening Google’s primacy and therefore, their core revenue stream. Google+ is a defensive move. Period. Google execs may shoe-horn it into Google’s espoused mission of organizing the world’s information but let’s face it, the social networking phenomena is a surprise to all. Geeks and pundits didn’t see it coming. Eric Schmidt has argued consistently Google is not in a zero sum competition with any of its digital brethren. That’s posturing and when you’re as big a player as Google, it’s gets old. Granted, not all competition is zero-sum but Facebook, Twitter, LinkedIn and even Apple’s Ping are walled gardens . Consolidation may come eventually but paradoxically, each is a land grab encouraging us to share our lives while there’s no sharing between these competitors. Switching costs in the toaster problem are relatively low. Learning and setting up a toaster is pretty quick plus let’s assume both toasters were paid for long ago. The primary considerations for switching toasters are capacity, versatility, space requirements, aesthetics and emotion. Does four slices trump the traditional two slice machine? Is the extra versatility of a toaster-oven worth the space requirements? And as all guys find out sooner or later, is your toaster as elegant as an Italian-designed Alessi kitchen accessory or decidedly gross and unattractive? Now the emotion kicks in. Sure that chrome beauty with the dents is gross but remember when you tried making grilled cheese sandwiches in it or nearly burned down your apartment when you reheated pizza on top of the slots? For the person that has to give up their toaster, or any other tool, there is an emotional cost of withdrawal that goes beyond functionality. When Google introduced their original search engine, the switching costs for Lycos, Yahoo and Alta Visa users were minimal. All were free and the mechanics of navigating to Google, making it your home page and learning how to use it were nearly identical to the incumbents. You could also try it and switch back with minimal effort so the opportunity cost was minimal as well. It was the lack of discernable difference that made using Google search immediately familiar. Research in switching costs has shown that users assess new entrants based on their past experience. As much as we’d like to think improved features attract users, new features provide minimal referent points and can just as easily confuse users. For example, when Microsoft first introduced Word, they lowered switching costs for WordPerfect users by enabling them to activate the WordPerfect keystroke commands instead of Word’s. By retaining the command structure of their competitors, Microsoft minimized switching costs. In search, minimizing the changes while providing differentiated accuracy and speed made switching to Google a no-brainer. Google faced a higher switching bar with its Chrome web browser. Changing browsers requires abandoning free browsers that are bundled with modern computer operating systems. (Apple’s Safari or Microsoft’s Internet Explorer). Then, you have to set up home pages, security settings, export and import bookmarks, passwords and any add-in tools you use. And then you’ll always find that some of the add-ins don’t transfer. Next you have to learn how to use the new browser. For the Silicon Valley techy, the difference may be as slim as that between Coke and Pepsi but for the grandma or plumber in Wisconsin, the change is more significant. After nearly three years, Chrome has garnered about 20% of the PC browser market compared to Microsoft’s 50% and Firefox’s 28%. Good progress but nowhere near the scale of their triumph in search. Google+ raises the switching bar even higher. In addition to learning how to use it, setup requires creating a personal profile and creating anew your lists of friends and groups. For now, let’s stipulate that the new Circles interface in Google+ is slick and intuitive. You still have to set them up. Then there’s figuring out the security options, etc. Let’s assume this all goes better than expected: what’s the result? Assuming you already have a Facebook account, you now have two social networks with overlapping functionality. With time as the scarcest resource we have, are you going to monitor and use Facebook and Google+ long term? 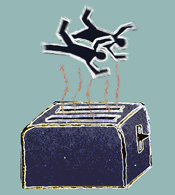 As painful as acute toaster separation anxiety can be, at least you didn’t have to involve your friends. I’m willing to bet that whoever bought the first fax machine must have bought two so they’d have someone to whom they could receive or send faxes. Without a sufficiently large network of users, new communication devices are special purpose or toys. Mass markets require mass adoption. I’d also assume most who are excited about Google+ already have a plot in the Facebook walled garden. You might move to Google+ but creating network effects requires them to move. Again, step back from the gearhead, early adopters and think about your college roommate who’s now a product assistant on Ice Road Truckers. She travels extensively, has only short bursts of downtime to check-in and finally got her security settings on Facebook as she wants them? What’s your pitch to her? Change or you’re not my friend? Social networking is still relatively new. The growth, boundaries and connections between social networking, work, society, mobile, etc. are only beginning to emerge. In new spaces, experimentation and serendipity are core to innovation and growth. Maybe Google+ Circles or “hangout” multi-person video chat will tap into something far deeper than I’m seeing today. What if they do? I’d expect Facebook to respond quickly and, in contrast to PC-based applications, Facebook can roll out changes across 750 million users instantly. Feature differentiation in the cloud is much harder to sustain. Additionally, Google has scale, wealth and a large universe of users across the web and Android mobile world. Just as integration made Microsoft Office nearly impenetrable, Google could do so for social. On the flip side, integrated products and services also are harder to develop quickly and keep synchronized. The strategy of Google+ reminds me of Microsoft’s PC strategy of “out-feature/outlast” that enabled Office to destroy Lotus 1-2-3, WordPerfect and others. The question is can and will Google sustain a similar effort and commitment behind Google+? This leads me to look a bit more deeply into the Google culture and their competitive response to Facebook. Specifically, where is social in Google’s DNA? In its forays into other areas, like phones, videos, maps, applications, and operating systems, Google had not acted in response to competition. If it had a good idea, it simply pursued it, no matter who was occupying the space. This project (Google +) was more strategic, even conventional. “It’s a good thing that Google is putting its weight behind social networking, but it’s reactive self-interest, not from a place of idealism,” said one key team member. “It’s not Google at its best, which is truly, truly pioneering. Whereas this thing is clearly more of a reaction to Facebook. A successful venture capitalist and colleague commented that both companies rely on technical wizardry from geeks. His argument is that Facebook’s engineers are no different than Google’s. Assuming that’s so, there still is a difference in heritage to the firms. Google’s strength is their ability to siphon, integrate and aggregate digital information through algorithms. Sharpening the PageRank algorithm does not require considering how people respond, cluster or pull back. In the past, Google has disdained that which cannot be automated or justified by click through data. Unlike Apple where design, style and human editorial control are part of the equation, Google continually tries to find a singular “right answer” in the data. In contrast, Facebook has focused from day one on social interaction. There’s no question that facilitating social interaction with computers requires someone to write code but requirements definition start with a different point of view focused on relationships. The difference is subtle but I believe significant. I doubt that Android phones would exist had not Apple created the new smartphone paradigm with the iPhone. (The same can be said for Microsoft Windows had not Apple created the Mac.) By following Facebook, Google+ fills some gaps such as in using Circles to create friend sub-groups. In fact, Google was smart to utilize the talents of former Apple MacIntosh designer, Andy Herzfeld, for major elements of Google+. We would be remiss if we did not turn the switching costs argument on its ear and ask what if we’re still early in the social networking game and just as Facebook took out MySpace, Google+ could do the same to Facebook by attracting a combination of new user as well as existing social networkers. Perhaps there is more latent dissatisfaction with Facebook than is obvious until there is a serious ocmpetitor? Certainly the social gaming firms that are dependent on Facebook such as Zynga would be delighted to have a competitor emerge. Google+ is reactive but frankly, those who think one can grow a great business by just inventing the future day after day are unrealistic. The major multinationals in our world live and breathe by attacking others and defending their spaces – think Colgate vs. Crest toothpaste. One could also argue that Google could learn a lot by competing head-to-head with Facebook. In contrast to Android where it competes with Apple via a completely different business model (supplied free to cellular handset manufacturers in exchange for the search and advertising), Facebook is mano a mano competition. However this turns out, it will be fascinating to watch. Now, who wants a toasted bagel? Before You Pitch Me, Ask Yourself: Is Your Company a Me-Too or a Fast Follower?